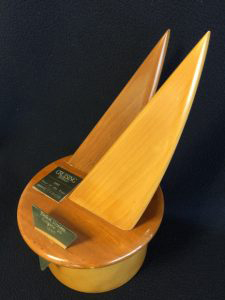 For 33 years, Steve and Doris Colgate’s Offshore Sailing School’s sailboat of choice for teaching beginners and coaching sailors to become winners, was the Soling, a 27’ three-person keelboat designed for Olympic competition. But Solings sink, do not have seats, and are not comfortable for teaching. Steve Colgate looked at all the boats on the market in 1996 but could not find any with the safety, performance and sophistication he wanted. And that's when he set about designing the Colgate 26; ideal for sailing lessons and coaching, it's virtually unsinkable and designed with comfort in mind. Offshore Sailing School, which Steve started in 1964, has used the Colgate 26 exclusively for our Learn to Sail holidays, sailboat racing classes and speed sailing courses since it debuted in 1997. And that year it won the prestigious Cruising World Magazine Boat of the Year Award in the Pocket Cruiser Division. That award is pictured to the left on this page. Many other schools around the U.S., in the U.K. and even in Dohar, Qatar, also provide instruction on fleets of Colgate 26s. 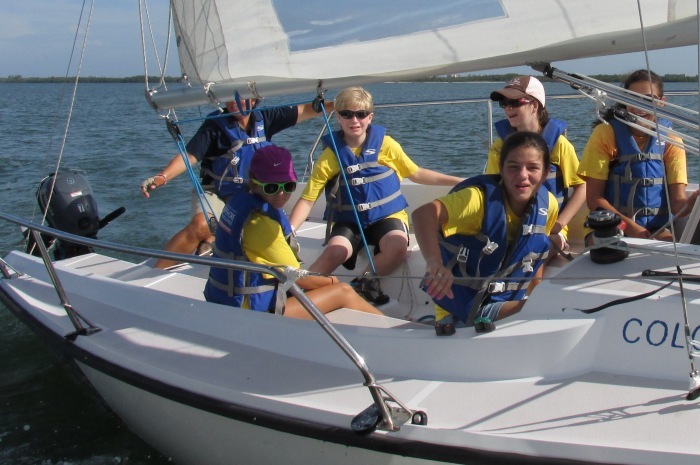 Colgate 26 sailboats are great platforms for teaching kids how to sail, and work together as a team. The Colgate 26 is forgiving when kids make mistakes. The Colgate 26 won’t tip over or turn turtle so there’s no reason to have chase boats hovering nearby. There’s plenty to do when teaching kids to tack and jibe, and enough room for as many as six kids to work together aboard. And the instructor has the “driver’s ed” end of the mainsheet in case the boat starts to heel too much. Kids love this boat! 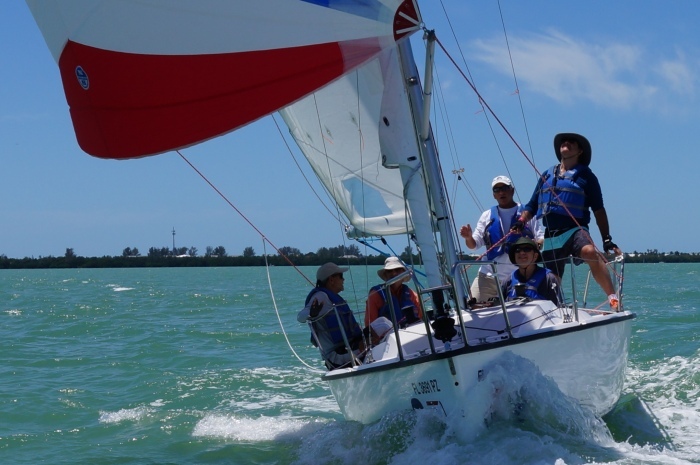 North U. has worked with Offshore Sailing School since 2000 to provide sailboat race-training with expert coaches aboard the school’s Colgate 26 fleet. In light air and heavy air, these boats provide plenty of opportunity for tweaking personal skills and boat performance. Universities and institutions like the U.S. Naval Academy have also long recognized the value of coaching plebes and cadets on Colgate 26 fleets. In 2015 the U.S. Naval Academy purchased 12 identical Colgate 26 sailboats that had to be no more than a 1 pound difference between each boat. This fleet of "Navy 26s" is used extensively for intercollegiate racing. 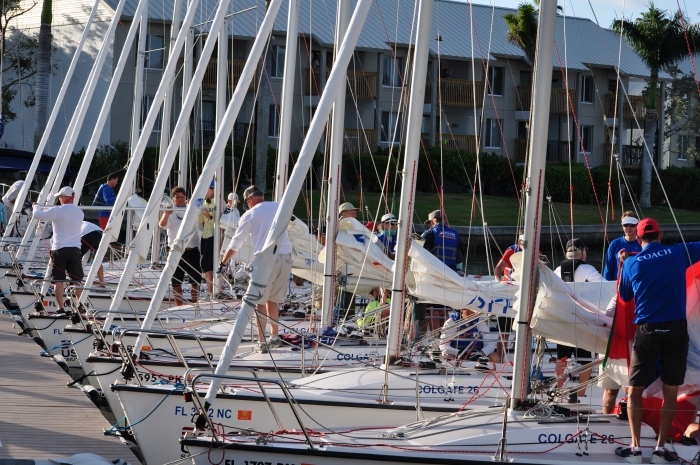 Schools and clubs that provide training on fleets of Colgate 26 sailboats have introduced sailing to corporations and associations in team building programs and leadership ventures. When a company wants to bring their employees together to work better as a team, but not put them through the rigors and embarrassment of rope climbing or other stressful activities, sailing is the solution. In a team building program on Colgate 26s, four or five adults with an instructor have plenty of room to execute maneuvers, with the comfort of ergonomic seating and safety features that keep the Colgate 26s on a steady keel. With little or no sailing experience, in less than a day teams are learning to make a boat go where they want it to go, with friendly competition between teams, and leaders rising to the task of giving commands that result in success.